The late summer decision to temporarily allow the rolling of the Toomer’s Oaks to continue bought Auburn University officials some time. But time is running out. 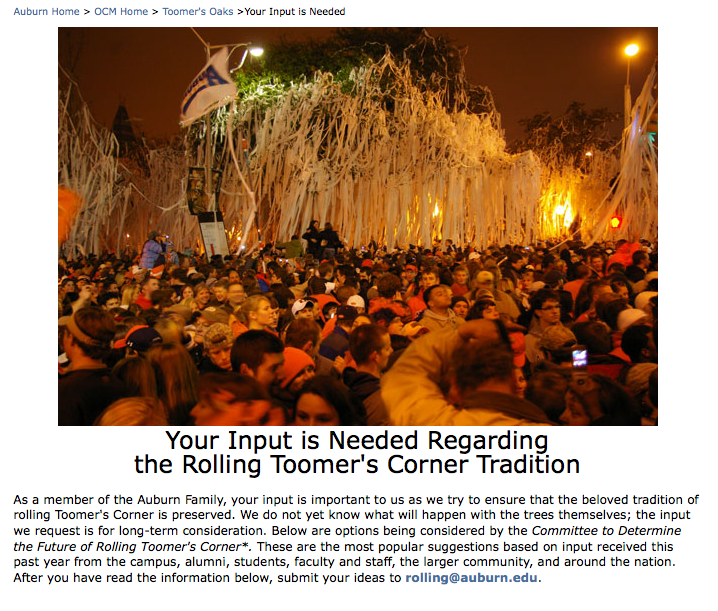 The first post-poisoning season of rollings nearly behind us, AU (without technically giving up hope that the trees could survive) is now asking fans to weigh in on the future of Toomer’s Corner celebrations, or at least the five possible futures as determined by a group of AU alumni, students, professors, and City of Auburn officials called the Committee to Determine the Future of Rolling Toomer’s Corner. The possible solutions should by now be familiar: replant new oaks (small or large), move the celebration back toward the center of Toomer’s Corner intersection, i.e. try to roll the power lines, light poles, etc., build an attractive intersection structure specifically to be rolled with toilet paper, or some combination of the above. In an August interview with Auburn University Communications Director Mike Clardy, TWER got as close as anyone has so far in getting an answer on just what exactly “attractive intersection structure” meant. In October we investigated the feasibility—and desirability—of a Toomer’s oaks transplant with Toomer’s Task Force point person Dr. Gary Keever. That Auburn is finally moving toward a permanent solution by officially requesting fan input (and, hey, what do you know using one our posts to help shape it) is what’s news here. To what extent that input will be taken into consideration regarding the final decision remains to be seen.